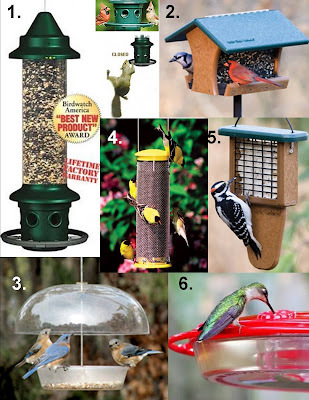 Wild Birds Unlimited: What is the best bird feeder? I want to buy the best birdfeeder as a gift. What do you suggest? There are a lot of feeders to choose from. With over 25 years of research and experience, Wild Birds Unlimited® is proud to offer you the highest-quality birdfeeders and birdfeeding equipment on the market today. Determine what birds you want to attract. There are certain feeders that are made for specific birds (i.e. finch feeder, hummingbird feeder). Squirrel Buster PLUS™: This is our best selling feeder. It has a large capacity and is easy to maintain. Built-to-Last Construction. Most birds are attracted to it including the cardinals. Oh and it’s SQUIRREL PROOF! Oh yes it is! WBU Recycled Hopper: Made from recycled milk jugs, these feeders are 100 times more popular than the old wooden box feeders. They look good, last forever, and all seed eating birds can use it comfortably. It’s easy to fill, it has a removable seed tray to allow for easy cleaning and dry seed, and it can be hung or pole mounted. Made in the U.S.A.
WBU Dinner Bell: Fill this versatile bird feeder with seed, mealworms, or a seed cylinder and see how many different birds you can attract. The dome provides protection from bad weather. It can also be hung or pole mounted using the WBU pole adaptor. Made in the U.S.A.
WBU Mesh Finch Feeder: The mesh tube not only lets finches land and feed in whatever position they choose, but it also allows air circulation to keep your Nyjer Thistle as dry and fresh as possible, something that's very important to our picky eaters.This feeder may be hung or pole mounted using the WBU pole adaptor. Made in the U.S.A.
WBU Recycled Plastic Tail Prop Suet Feeder: Common birds that eat suet are downy, hairy, red-bellied, chickadees, and nuthatches. The paddle simulates a tree trunk and offers birds a place to prop their tail while they feed. It won't rot, crack, fade, or warp like wood can and are easy to fill and clean. Made in the U.S.A.
fly south for the winter. These are just some of the best feeders to start the hobby of backyard bird feeding. I didn’t even get to the Oriole feeders, window feeders, tray feeders, ground feeders, or other specialty feeders. But don’t be overwhelmed. Wild Birds Unlimited doesn’t just sell bird feeders and bird food. We also give you accurate information about our local birds. It is our goal for you to have the best possible experience from your bird feeding hobby. Backyard bird feeding is the most relaxing, fulfilling, educational and exciting hobby that anyone can enjoy. At Wild Birds Unlimited, we are Your Backyard Bird feeding Specialist®, here to help bring you, and nature together. Come in and we'll help you decorate your yard with birds this winter!